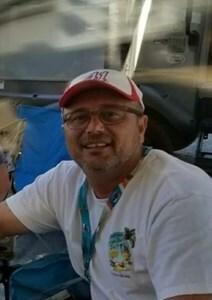 Timothy E. Johnson, 46, of Olathe, KS passed suddenly Tuesday September 4, 2018 in his sleep. A visitation for family and friends will be from 12-2PM Saturday September 8 at Penwell-Gabel, Olathe Chapel where Military Honors will be at 2:15PM. Tim was born September 22, 1971 in Burgaw, NC to Dennis Johnson and Pansy Brinkley. He graduated from Pender High School, joined the NAVY and honorably and selflessly served his country and fellow brothers during the Gulf War. He married his best friend Kelly Shutter in June of 2002 and had his one and only child, Adelynn, in October 2007. He lived life to the fullest, never knew a stranger, gave the shirt off his back a MILLION times, said things no one else would, stayed true to his core beliefs even if it left him feeling alone, loved the KC Chiefs and KC Royals, NASCAR and golf, appreciated and advocated for simple and genuine acts of kindness and forgiveness, loved/missed/admired his “brothers” (Navy boys you know who you are…), he loved to chit-chat, listen to music, cook; he was a drummer, an entrepreneur, a business man. He was ANYthing and EVERYthing he ever put his mind to, success or failure, he always tried. He lived by this rule each day of his life and instilled this within his girls. He was preceded in death by his Grandfather Fletcher E. Johnson who was his Idol and Hero and man he always wanted to live up to, his Grandmother Myra Johnson, Aunt Harriet, Uncle Johnny. He is survived by his wife of 16 years Kelly L. Johnson and their child Addie, his father Dennis Johnson, mother Pansy Brinkley, his Father-in-Law Greg Shutter, Mother-in-Law Kathy Shutter, Uncle Keith and Aunt Laura, Aunt Francis and Uncle Kenneth, Aunt Carolyn and Uncle Earl, Aunt Betty Lou along with many, many cousins- all of whom he loved. To leave a special message for Tim's family please use the "share memories" button above. Add your memories to the guest book of Timothy Johnson. I really miss my dad and this time of the year he would be stomping on the roof trying to get the Christmas lights working. Every now and then I Holor out for him forgetting that he’s gone it’s so hard without him and one time he bought a random persons groseries for them I really miss him?? So sad to learn of Tim's passing. He was extremely great to work with at POWER Engineers. Tim was exceptionally pleasant and helpful to me. Very sorry for your loss. So sorry for your loss. I went to school with Tim at east duplin high school. Have alot of good memories of him. God bless you and your family. Tim was one of the few people that I had the pleasure of meeting in life and calling a true friend that will never be forgotten. Tim had a smile that brightened the room and you rarely saw him without it. When asked how Kelly and Addie were doing, his eyes sparkled and his smile got bigger. He would reach for his phone and show the recent pictures of his lovely ladies. Tim loved them so very much and you could hear it in his voice. Tim had a heart of gold and he will be missed. I worked with him while he was at POWER and always enjoyed his positive outlook. My thoughts and prayers will be with his family as they learn to carry on without his daily smile and laughs. We were coworkers on a couple of projects in Phoenix, and Tim became a friend. I’ve worked with few people more supportive, quick-witted, or upbeat. He’s was eager to lift me in difficult times, which I will always appreciate. We learned alot from each other over the years. We been thru alot of the same medical issues along with being in the Navy. take care and i will see you on the other side. God Bless. you will definatly be missed. What a beautiful tribute. Our hearts are with you today and always. Unfortunately, because of distance we did not have the opportunity to know Tim very well. When we did get together Tim always offered smiles, laughs and a very welcoming personality. Through social media we were able to experience your special family connection. Our thoughts and prayers are with you as you find courage and strength on a daily basis. Tim will always be in your hearts and a part of your soul. This is something you will never lose. Tim will be looking down on you, you will feel his presence and you will smile. He will be so proud!! God bless you. Words cannot begin to express our sorrow over Tim’s death. I only knew him through his dad and have always been so touched by his generosity and love for his family. Tim was a wonderful son, a shining example of what a father/son relationship should be. Our thoughts and prayers are with all of you. May God provide amazing comfort to you during these difficult days. I met Tim through Addie and my daughter Lacey. They were friends in school and had many play dates. Tim happened to be outside one day as we were picking up my daugther and invited us in. That was all it took and our families became quick friends. We created some silly awesome crazy memories and adventures together that could never be forgotten. He was always willing to lend a helping hand to anyone that needed it. He could warm anyone's heart just by his laughter, smile, and kindness. When Tim and Kelly moved into their home in Arizona they had a housewarming party and invited every single person on the street. As people walked in Tim introduced himself and said "Have anything you want or need, even if you want to take a shower, my home is open to you". And that, was the kind of guy he was. Tim was the true definition of the phrase "One of a kind" He will be forever missed. Kelly and Addie, we love you. A great man and loyal protector of our Country! Tim had a personality bigger than life and he could be best friends with just about anyone in no time at all. With that big ear to ear smile and those hilarious stories he would give us stomach cramps from laughing! Everyone will be telling his stories for a long long time. God bless you Tim! And, God bless Kelly and Addie! My Wife Chris and I met Tim, his Wife Kelly and Daughter Addie back in 2016 through our Daughter Sara Heath. Tim was as everyone has said and awesome guy that could talk to anyone, his stories were fun and memorable. When I told Tim I was having my birthday party at our home Tim said that he would get the best barbeque that we have ever ate, I asked Tim where he was getting it and he said North Carolina. Sure enough Tim followed through and the Barbeque was shipped from North Carolina and it was as Tim said the best barbeque we have tasted, thanks Tim. Kelly, Addie Chris and I are so sorry for your loss, your Husband and Father will be looking down on you always. Although this is a time of sorrow it is a time to share the Life of Tim which was so big, what a guy we will never forget him. I met Tim at POWER's PM/PE Training in Boise and I actually sat right behind Tim. I really enjoyed getting to know him and eventually got the opportunity to work with Tim. Tim was always open and honest and put all of his energy in whatever he was working on. Tim cared about others and was always willing to help. If the world had more straight shooters like Tim that could just tell it like it is, this world would be a better place to live. I'll miss that big smile and that greeting I received every time I saw Tim. Tim could talk to anyone about anything and he was always fun to listen to. Tim was a good man and always supported what was right, not what was easy. My thoughts and prayers go out to Tim's family. He will be greatly missed. I worked with Tim in Phoenix and will never forget him. In fact, I know I'll be sharing "Tim stories" for the next 20 years because he was such a force of nature. All of us should remember that the last thing our friend would want is for us to be sad, he would want us to enjoy life and that is what I plan to do in honor of his memory, in honor of his service to our country, and in honor of his legacy. What to say about Tim that hasn't been covered above? Tim was a great guy. He was always a joy to be around. He challenged you to some how have more fun than he was when you were with him. This was an impossible task because no one could ever have more fun than Tim. His positive attitude always elevated the mood anywhere he was. There is no word that comes to mind how lucky I always considered myself when ever I got to hangout with this guy. Being prior service and from Kentucky, I welcomed his one of a kind accent and sense of humor. I cant imagine what Kelly, Addie, and the rest of his family must be going through. The only advice I have to give is what would Tim want? If I had to guess it would be to remember him and the great times we have all had with him. That is what I will be doing. Tim, You'll be missed brother. Kelly, the sadness you feel right now will dull after a while. I only had the pleasure of knowing Tim for one short week here at Kiewit and boy did he make an impression. His magnetic personality was so awesome to be around. He was a man of action - jumped right into his new department/role with sleeves rolled up and ready to take on the challenges presented to him. To say he will be sorely missed is an understatement. My prayers go out to all his family, especially to Kelly and Addie. My sincere condolences to Tim's family and friends. I worked with Tim for a short time in the Lenexa office of Power Engineers. He was full of energy and fun. I'm sure he will be sorely missed. May fond memories and friends and family bring you comfort during this difficult time.